The following excerpt is from the chapter “Powers Done Dirt Cheap”. 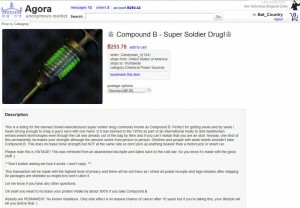 It describes the history of so-called “super soldier drugs”. Want to learn about the other four formulas? Back the Kickstarter! All of the hundreds of known super soldier drugs can be traced back to one of six formulas. The first of the formulas, the American-created Peak Performer formula, sparked an international arms race between nations when it was made public in 1947. Nations raced to create their own super soldiers through whatever means were available. By the end of the Cold War, the six major forumulas had been discovered. The fall of the Soviet Union and pressure by a coalition of superheroes and activists ended research and development into the field by government and corporate institutions. The UN later banned the use of the six formulas in frontline combat troops after reports of atrocities by super soldiers during various conflicts in the 1990s created widespread outrage. Since then, virtually every government has banned super soldier drugs for most if not all uses, even for life saving medical purposes. Some pharmaceutical corporations lobby for relaxing the rules, arguing that milder, diluted versions of the drugs could benefit the public but no politician wants to be the first to make these drugs legal. Ragnarok has not changed this equation yet but many advocates for legalization of some or all of the drugs have emerged to argue their case. Some ask that police and military operatives be allowed to empower themselves with the drugs, although some cops and soldiers already illegally ‘juice’ themselves. Others point out how lawless base raiders empower themselves recklessly, endangering themselves and others in the process. Legalization would reduce that risk. Corporate advocates lament the loss of a potentially huge market for ‘over the counter superpowers’. So far these arguments have not persuaded the powers that be. Peak Performer: Enhancement drug that increases physical and mental performance. The original formula transformed its recipient into a world class athlete and drastically improved memory, mental acuity, and bravery. There are few side effects, except for increased aggression and antisocial behavior. Variations of the formula often focus in a single area: increasing IQ or agility for example. This is considered the safest drug but its effects cannot transcend absolute human limitations. Interestingly enough, the US military conducted research on combining Peak Performer with other super soldier drugs and achieved limited success, a rarity in the field. Adding more than one drug in a single human is unpredictable and many times fatal. However, the military found a way to safely enhance a human with Peak Performer before introducing another super soldier drug. This research is heavily protected, although its existence may inspire similar work around the globe. Peak Performer is the most common of all super soldier drugs and some consider it too weak to be considered a ‘real’ super soldier drug today. Despite this, it is still treated as one. Two variants have become highly valued street drugs, sold to the wealthy elite. “Harmony” provides a temporary boost to emotional stability, easing the pain of psychological trauma and providing a sense of wellness to the user. However, in order to achieve this effect, Harmony is mixed with powerful antidepressants. This prevents Harmony from permanently improving the user’s emotional stability and causes depression during withdrawal. The other common variant, “Boost”, increases intelligence on and is used by lawyers, bankers, doctors, and other high earning professionals. At least those that can afford it and can find a dealer that actually has Boost for sale. However, Boost’s effects are permanent, which is a problem to the very few drug dealers that sell it. One sale does not a business model make. So far, they have resorted to two common tactics: lie about the permanence of the drug and sell placebos (which may be addictive drugs) or blackmail their clients for regular payments. Krutov Protocol: A Soviet made formula aimed to boost resilience and strength to superhuman levels, the Krutov Protocol is a set of drugs administered over a period of three weeks. The recipient falls into a coma and undergoes a metamorphosis that lasts for approximately two days. The subject must be hooked up to IV feeds to fuel the transformation. During this time, the subject’s body radically changes. His bones and connective tissue become incredibly strong, yet only slightly heavier and less flexible. Muscle tissue becomes vastly stronger, raising the subject’s strength to superhuman levels. Skin becomes dense enough to serve as natural armor. The recipient typically gains regenerative abilities as well. The character typically gains several inches of height and gains a large amount of weight from the transformation. Furthermore, they are noticeably different than humans, as their armored skin is instantly recognizable. Administering the Krutov Protocol requires a specially trained medical technician or doctor and support equipment to keep the subject alive during the metamorphosis. However, variations of the Protocol have emerged that cut down or eliminate these requirements. The most common variation, “Compound B13” promises about half the end result for a fraction of the cost. One injection of Compound B13 puts the subject in a 12 to 30 hour coma. New, denser muscle tissue is grown and bone strength is enhanced. The skin begins to harden as well but it takes months for a B13 subject to grow effective natural armor. Virtually all of the subject’s fat is burned up during this period and the amount of strength enhancement is proportional to the amount of fat lost during the coma. Furthermore, this places an incredible amount of stress on the subject’s body, drastically shortening lifespan and increasing chances for cancer, especially skin cancer. All variations of the Krutov Protocol cause great damage to the subject in the long term. Of course, most users gladly pay that price for the power it grants.